Don't Go Bush Before Having A Good Piss, Mate! "Right as I'm about to bounce bro, bam! This bomb, bangin' dime starts rollin' up on me." "Naw..." "On the real." "On the real?" "Dog, an L.A. ten. Fake everything and everything, feel me?" 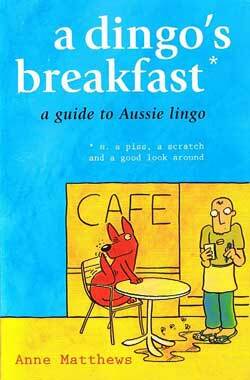 Like Wicked Words, The Official Spanglish Dictionary, and other flippant linguistic aides, A Dingo's Breakfast by Anne Matthews explores the globalization of the English language by giving its Australian mode a long-overdue riff. This guide will have youse speaking Aussie in no time. A Dingo's Breakfast shines a light on some of the particularly curious dialectic departures of the Oz vernacular, including the Aussie penchant for understatement (where the description "a bit" actually implies a large degree, as in, "She smiles a bit"), abbreviation (where do you think the word "fugly" originated? ), and the amusing custom of creating rhyming slang. So if you say mallee root, you're referring to a prostitute, not a plant; the name Pat Malone doesn't denote a man but being alone; and if you hear an Aussie mention a septic tank, then he's talking about you or me: a Yank. Charming blokes, Asstralians. There are also great expressions like, "Don't piss down my back and tell me it's raining" (Don't lie to me), "Call God on the big white telephone" (Vomit into the toilet), "Not worth a fart in a hurricane" (useless), and "No wucking ferries" (try reversing the "w" and "f"; also just "No wukkas"), not to mention perennial favorites like, barbie, bloody, crikey, mate, and piss. The book doesn't pull many punches, and you can see spoken Australian with all its cultural warts, including racist and sexist slang, and a good supply of curses. In other words, A Dingo's Breakfast is the real McCoy.